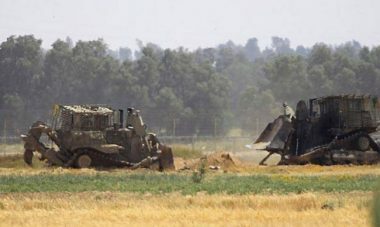 On Monday morning, Israeli soldiers, accompanied by armored bulldozers, invaded Palestinian lands, east of the al-Qarara town, north of Khan Younis, in the southern part of the Gaza Strip, and bulldozed lands close to the border fence. Media sources said the soldiers came from Kissufim military base, across the border fence, and carried out a limited invasion into Palestinian lands, before uprooting them. The soldiers used smoke bombs during the invasion, while military drones hoovered over the area.